Can you relieve joint pain at home without undergoing any aggressive treatment or surgeries? Yes, it is possible. Read to learn more. Many people struggle to relieve their joint pain with not much success and give up altogether. Probably you have used painkillers and other prescribed medication to control and relieve your pain without success. If you are one of these people, then you have come to the right place. I know how frustrating and desperate it can feel. Joint pain tends to immobilize and sometimes even cripple people. Do not give up; you can still find relief. You will learn different practical ways you can use at home to relieve and possibly prevent joint pain. I use them, and they have often worked. Joint pain is a common problem people of all ages face though it is prevalent among the elderly. You are not alone; I have been a victim of joint pain too for quite a while now, and I know how desperate one can be. I have struggled and tried different pain relieving techniques, but most did not offer the relief I was expecting. 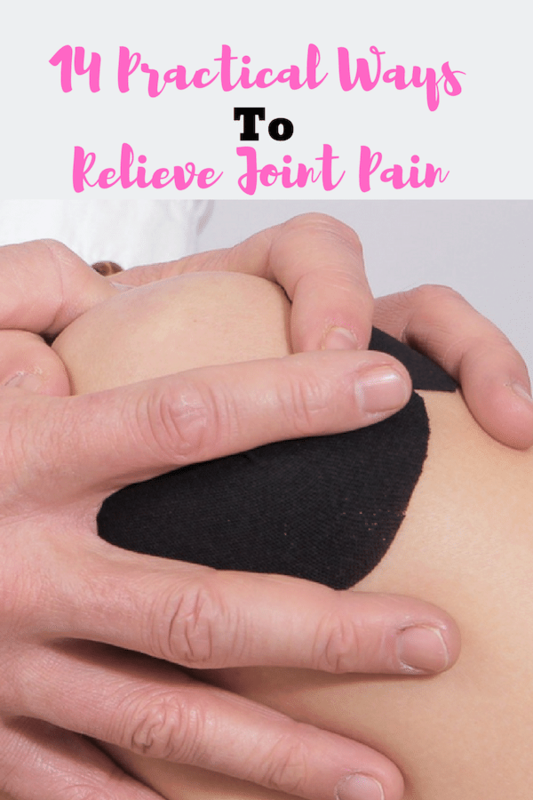 In my desperation, I discovered these 12 ways you can do at home to relieve joint pain without necessarily undergoing any aggressive treatments or surgeries. Most people experience joint pain around common areas such as knees, hips, neck, back, and ankles. Common causes of joint pain. There are different causes of pain. Joint pain can be as a result of any of the following. Here are the 12 proven ways you can relieve your joint pain. 1. Reduce weight if you are overweight. Too much weight can exert pressure on the joint and ligament causing wear and tear which can contribute to joint pain. The main weight-bearing joints such as the hips, knees and the spine become vulnerable to injury when one is overweight. To avoid these kinds of injuries and relieve joint pain. Try to reduce and maintain a weight that is appropriate for your body. It’s essential to control and to maintain a healthy lifestyle. Eat healthy to keep off excessive weight. 2. Exercise but don’t overdo it. Exercise helps strengthen bones and muscles around the joints. It reduces joint pain by increasing the circulation of blood and enhances healing of injured joints. Inactivity or lack of exercise can weaken bones and create stress on the joints. Exercise should be done in moderation because too much can be dangerous. Over-exercising can contribute to wear and tear of the joint as well. Whenever you’re exercising, protect weaker joints or ligament from injuries. Moderate exercise will reduce or prevent more injuries to the affected areas because they may take so long to heal. It is good to take a break whenever you are feeling pain. 3. Eat a healthy balanced diet. You can relieve joint pain by eating a well-balanced diet. Eat foods low in fat and salt. Incorporate plenty of fruits, vegetables in your diet, whole grain, and nuts. It helps to improve the circulation of blood to the affected joints. Healthy foods low in fat and salt can help open crowded or blocked arteries which might be contributing to the pain. Eat a diet rich in Anti-inflammatory foods containing Omega-3 Fatty acids. They can help relieve inflammation and pain. Avoid highly refined or processed foods such as sodas, red meat, and fried foods. They tend to aggravate pain and accelerate the disease process. 4. Use the affected joints with limitations. 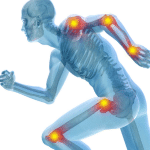 Injury of joints can result in chronic disability. It is therefore vital to limit using or exercising the affected joint areas such as the ankles or knees. Overusing them can cause more harm than good. If you have to exercise, let it be moderate. You can as well try to modify your exercises to accommodate the painful joints. 5. Maintain a good posture. Poor posture can contribute to joint pain. Use the correct position when standing, bending, sleeping, sitting or lifting objects to protect your joints. Using the right posture will protect your muscles, ligaments, and joints from unnecessary strains, breakage or injuries. Other than maintaining the right position, it is also important not to remain in the same place for too long. Moving around is essential for your joints and your overall health. Try to watch your body parts such as legs, back, and neck whenever you’re standing or sitting down. Make sure the joint areas such as your back, shoulders, and neck are supported and aligned correctly for the muscles to function correctly. In case your job involves lifting, use the correct body mechanics to lift or transport equipment or object from one place to another. Use the necessary equipment to transfer or carry heavy objects to reduce any stress being exerted on the ligaments holding your joints. Sit on a comfortable ergonometric chair that supports your back and neck whenever you are typing or reading. Have an adjustable computer table that can be adjusted to suit your height. Massaging the affected areas can help relieve joint pain. You can have your partner massage you at home or get a professional to do it for you. Massaging the affected areas can provide relaxation, relieve discomfort and pain. You should try to avoid any uncomfortable friction when doing a massage because this can aggregate pain. Apply some lotion or a homemade pain salve to massage the areas affected. Avoid pinching or grabbing muscles; they may become more painful and sore. You can as well buy a heat massager if you do not have anybody to message you. Hydrotherapy can help alleviate joint pain. This is a type of therapy that uses water to treat and relieve pain. It involves doing special exercises in warm water in a pool or bathtub. The exercises are intended to help a patient adjust and strengthen his range of motion. The warm water tends to relax and stimulate the circulation of blood around the painful areas, hence making them less painful. You can have hydrotherapy done at home in a hot bathtub. Immerse the painful joints in the warm water and stretch or exercise them gently. Massage or soak the painful joints or your whole body in the water for some time. This will help relax your muscles and relieve pain. The advantage with hydrotherapy is that it can support the aching limbs and make them easy to move. It can also improve your flexibility and stability. 8.Natural remedies and essential oil mixtures. Some natural remedies such as ginger, turmeric, willow bark, and Aloe Vera do help relieve pain. These remedies have proven to be effective in treating joint pain because of their anti-inflammatory properties. Most of these remedies are non-toxic, inexpensive and pose a minimum risk for people using them, unlike most modern medicines. Natural topical oils and Essential oils such as; eucalyptus, lavender, peppermint, rose hip, and clay Siege can be helpful too. These oils have been used over centuries and have proven to be quite helpful in relieving pain. Some natural homemade pain salves are also good at relieving pain. The good news is that some of these remedies are in your kitchen pantry. For instance, ginger and turmeric are common spices you can add to your foods. Physical therapy can help manage joint pain; in fact, some physicians recommend it for chronic pain sufferers. The therapists involve many different types of pain management techniques to treat pain. In most cases, they use; manipulation of joints, massage, movement, exercise, and stimulation to relieve pain. Physical Therapy helps to relieve pain in the affected areas by tackling the physical aspects such as inflammation, stiffness or soreness. The main aim of physical therapy is to help the body heal naturally. The treatments are aimed at encouraging the body to produce the pain-relieving chemicals necessary for healing. Physical therapists will in most cases tend to use a combination of different approaches to solving chronic pain issues. Please consult your doctor before visiting a therapist. You may need him to prescribe some medication or give advice about the right approach to take. Work with both your doctor and your therapist for better outcomes. Rest can relieve joint pain since, during sleep or rest, the body renews and repairs worn out body cells and tissues. It enhances the healing process of the joints. Rest also helps to strengthen your body’s immune system and protects you from acquiring diseases. Take frequent breaks between activities to relax. Try to get enough sleep each night. Joint pain can also be relieved with meditation. Meditation is a way practice that uses a technique that enables an individual focus on increasing calmness and relaxation. It is geared towards achieving mental clarity, coping with pain and emotional stability. Meditation can help control and relieve pain by relaxing both your body and mind. It enables you to focus on positive aspects and step away from negative ones. Focusing on the positive aspects of life can help decrease stress and pain. Meditation can help you cope with pain and develops a positive attitude toward life. You may be able to understand what is happening to your body in your mind. Meditation can help you draw your attention to positive or purposeful thoughts rather than your pain. Anti-inflammatory non-steroidal, Narcotics, and analgesics are among drugs that are used to relieve and treat joint pain. The problem with these drugs is that most have synthetic elements and chemicals added to them. Most modern medicines only tend only to relieve the symptoms instead of curing the pain. They may also have possible side effect so take them with caution. Talk to your primary health provider and let him help you choose the best drug for your pain type. There are a ton of supplements in the market today that promise to relieve pain. Unfortunately, not all are effective, but there are few that help by reducing inflammation and reduce pain. For any supplements to work well, use them in combination with a healthy diet, and exercise regularly. I found turmeric and capsicum to work well for me. You can try any for relief. These have been practices for centuries to reduce pain and stress. Yoga and Pilates help to relieve muscle tension and pain by improving your range of motion. Frequent yoga can increase the circulation of blood around the painful joints and also helps to improve muscle strength. You should Start with simple poses and increase the intensity as you get more relief. Do not overdo it because it may result in more pain. Try these practical ways to relieve your pain but if the pain persists, consult your primary physician. Previous Post: « SUGAR- FREE HOMEMADE PINEAPPLE JAM.